IC 63 is an extremely faint nebula. I have tried it before - being so close to gamma Cassiopeiae its easy to locate, but my sky brightness has always prevented me getting much more than a smudge. This is not a "great" image, but a vast improvement. It was captured at high gain to take advantage of every photon and could do with 50 frames to drop the noise level down - or longer exposures at a lower gain. But the tracking is not up to that. When the tracking is that good, I will get some proper emission line filters. Mind you, with exposures of that length and gain I was very glad of my Direct Bias Amp Off removing all the amp glow! 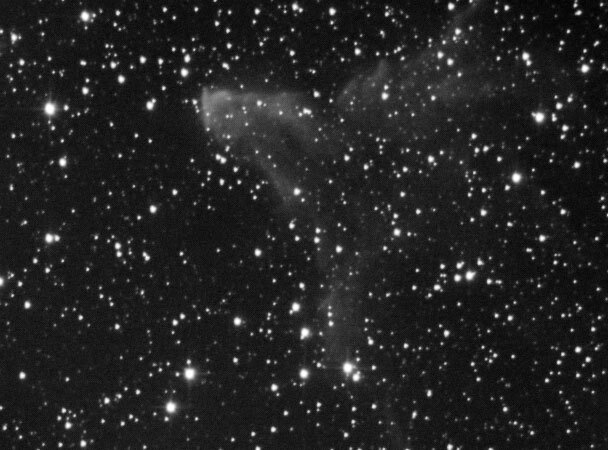 For this object, and its friend IC59 I really need less focal length. Captured in k3ccdtools. Stacked in registax. Saved as 16 bit FITS. Opened in photoshop. Curves to bring out nebula. 50% darken faded minimum filter to reduce star brightness. Bit of NeatImage to knock the edges off the noise. This image was captured as a test of anAstronomik CLS broadband filter.